Linens, Things and More…not only provides Los Cabos with custom wedding and event rentals, but our design team goes above and beyond to personally make sure your special event reflects your vision and style! As a rental and design company, we cannot overemphasize the importance of chairs in your overall décor style. This week, we want to share the classic chiavari design and the many ways you can use this beautiful chair to dress up your next special event in Los Cabos! 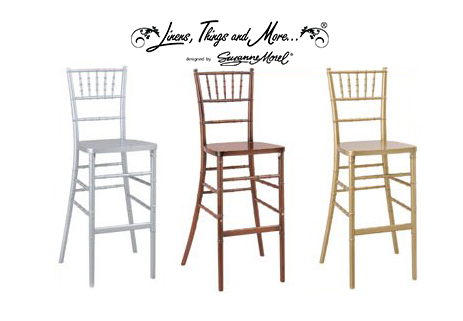 The chiavari chair lends an elegant look to any wedding ceremony or reception. This versatile chair comes in both high and low styles to suit any cocktail hour or dinner party with high tables. Chiavari chairs look great in any finish, and are the perfect complement to any traditional, modern or rustic décor design. This entry was posted in Weddings and corporate events decor and tagged Cabo wedding ceremony chairs, Cabo wedding reception chairs, Chiavari chairs in Cabo, event chair rental in Cabo, gold Chiavari chairs, high chiavari chairs, silver chiavari chairs, Tiffany chairs, wedding and event design Los Cabos, wedding and event rentals in Cabo, wedding chairs in Cabo, wooden chiavari chairs.